Caption under first photo: GIRL CRICKETERS at St. Kilda today: Miss D. Williams (Ballarat) in action against Yallourn. The wicket-keeper is Miss L. Nicholl. Source: ‘The Herald’ Tuesday 19 April 1938. Page 24. Note: Miss Nicholl (perhaps incorrect spelling in the above photograph- see below) was the captain of the Yallourn team in 1938. 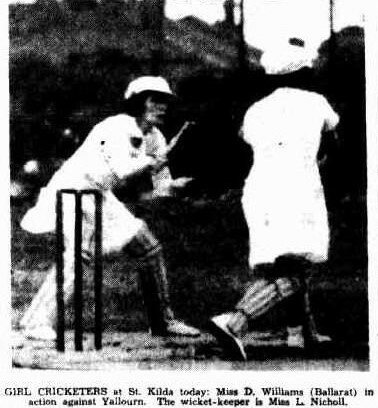 According to the ‘The Argus’, the Women’s Cricket Country Week in 1938 was the first of its kind ever held in Victoria. During that week, Yallourn played in several games, which included matches against combined teams from Ballarat and Geelong. The games were played on the ovals adjacent to the St Kilda Cricket Ground. The Yallourn Women’s XI performed creditably during the inaugural series; and won its way through to the Grand Final against Ballarat. Unfortunately, the extract of the match review was difficult to read; but it seems that Ballarat (82 runs) took the honours in ‘the decider’ by sixteen runs. Players to perform well for Yallourn included Mesdames Gore, Crane, Whitmore and Nichol. The Yallourn Women’s Cricket XI was most successful in the Country Week Championships of the late 1930’s; and it seems to be a team that deserves greater recognition in the sporting archives of Yallourn. Unfortunately, the history regarding those formative years of women’s cricket at Yallourn is elusive; and any readers who may have further information about the players selected in that team, are encouraged to contact Julie.